The border trade in Scandinavia has changed a lot over the last decade. Huge shopping malls are being built along the Swedish side of the border with Norway, giving the consumers easy access to the European Union price level for food. Oslo is just ninety minutes away from the border, so this is ideal for an afternoon of shopping. 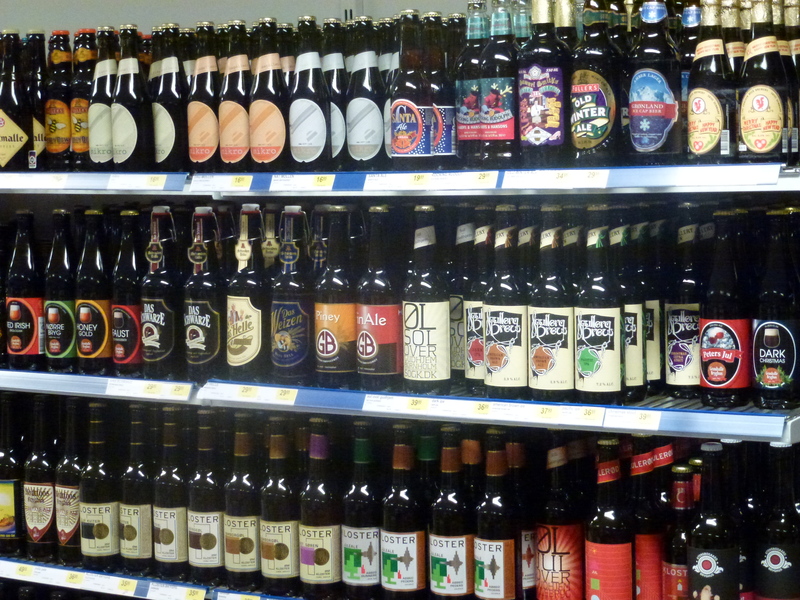 There is not as convenient for beer drinkers, as the legal quotas are low, and the beers available in Swedish supermarkets are of the severely diluted category. There used to be a similar thriving market in the ferry ports of Jutland, Denmark, but the Swedes can do their shopping cheaper in Germany while the Norwegians find Sweden more convenient. The ferries do, however, still shuttle back and forth between Oslo and Frederikshavn, and last weekend I took the 24 hour return trip. The ferry does not have any beer worth mentioning, and I frankly did not expect much when I went ashore on Sunday morning, either. The two supermarkets closest to the port are both boarded up, and I was heading for a discount store in the centre of town. But there was a pleasant surprise on the way. 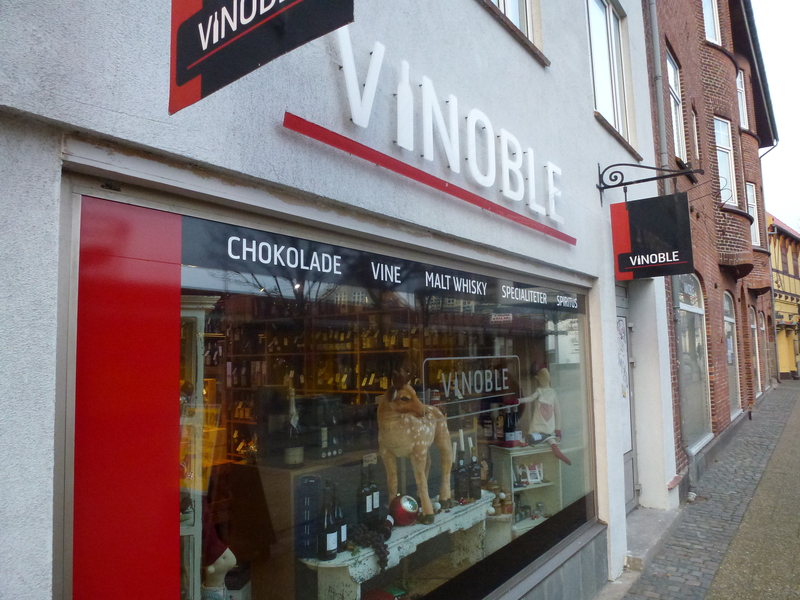 The Vinoble wine store, which used to be a fairly small shop and with limited opening hours, has adjusted to the new times. They have expanded the shop, meaning there is a lot more room both for wine and for other goods. The beer shelves are fairly well stocked. Belgian beers, including trappists, English brews from the more standard offerings to Fuller’s Vintage 2011. A lot of Danish micro beers, too, though it seems many of them come from the same company, Klosterbryggeriet, which uses a number of labels and beer series, contract brewing them in various parts of the country. As usual, I filled my bag with more than I had planned to buy. Friendly and personal service, too, wrapping each bottle in paper for me. I hope this shop doesn’t go the same way as the supermarkets. Maybe they have a combination of locals and day trippers that makes it worth while to stay in business. And don’t get me wrong, this is not a ghost town. People go about their business, this is a fair sized Danish town with shops and services, beaches and pubs. And they probably don’t miss all the drunken Swedes. on November 20, 2011 at 7:37 pm | Reply Kort nyt: Beerwalk, Klosterbryggeriet, Krenkerup, Løkken, ølafgift, Nibe, Stronzo, Carlsberg, Sorø osv.